Dix Hills Animal Hospital has recently moved beyond traditional therapies to bring the latest technology to their practice. What was once thought of as science fiction is now being used to heal suffering pets. They are among only four animal hospitals on Long Island to offer stem cell therapy. “I am so excited to introduce Stem Cell and Platelet Rich Plasma (PRP) therapy to help dogs and cats on Long Island with arthritis, joint pain and other inflammatory issues,” said Dr. Alison Rhein (Dr. Ali). The hospital has invested in MediVet Biologics stem cell therapy which uses the pet’s own stem cells for treatment. This is called Autologous Therapy- when the stem cells come from your own body’s tissues. Unlike embryonic cells, these are adult cells, so there are no ethical or moral concerns in place. MediVet’s technology utilizes the body’s own regenerative capabilities by extracting adult stem cells that occur naturally in the body. These stem cells are taken from Adipose Tissue (fat), woken up and reintroduced directly into the pet’s damaged areas. Dix Hills Animal Hospital does the entire stem cell treatment in-house in one day. “This cutting edge technology gives owners a non-invasive, natural option to help their pets in addition to traditional methods of surgery and medication. With new treatment applications being discovered and researched every day I am looking forward to being able to offer this therapy to my patients,” Ali said. However, stem cell therapy is not for every pet. They must be screened first to make sure they are the right candidate. This type of procedure, Ali said, offers an alternative treatment for pets suffering from osteoarthritis, hip dysplasia, ligament and cartilage injuries as well as other mobility ailments. 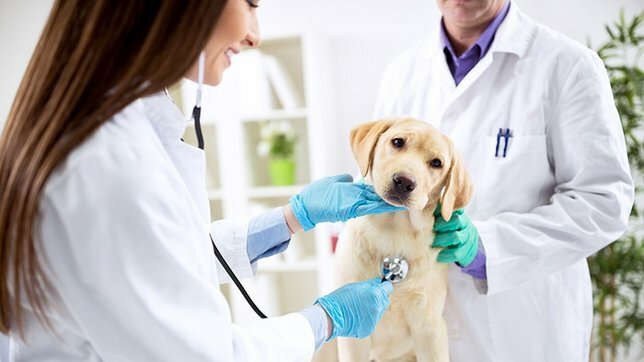 Pets suffering from any of the prior are usually on daily medications that require monthly blood work and monitoring, all of which become pricey over time. So what will this state of the art medical treatment cost you? Surprisingly, because the treatment is non-invasive, in many cases it is less costly than surgery. The procedure takes about four to six hours from start to finish and starts at $1,600 to $2,300. While traditional surgery could easily come to at least twice the price. Recovery from the stem cell treatment is minimal and the short term effects take anywhere from 3-10 days from the procedure to up to a month. Whereas traditional surgery usually is lasting, stem cell treatment has 12-36 months of good effects. The hospital also gives you the option to bank your pet’s stem cells. One pet stem cell extraction could provide you with two to three treatments. The stem cells are then shipped off site to Medivet, cryo freezed and stored until used. Just a few weeks ago Dr. Ali and her team completed their first two stem cell therapy cases. Both pet owners said it’s too earlier to see the true effects of the treatment, however their pets are not any worse then before the procedure. To find out more about pet stem cell treatment and to determine if your pet is a candidate for stem cell therapy contact Dix Hills Animal Hospital at 631-271-8383. Subject: LongIsland.com - Your Name sent you Article details of "Same-Day Stem Cell Therapy for Pets Comes to Long Island"